Won't drip or produce soot. Provides many hours of cosy lighting. Swedish-made wax candles of 100% stearin. Classy 100% stearin wax candles. Fluted base for snug fit into any candlestick. Length: 28 cm. Burn time: approx. 10 hours. Nordic Swan ecolabelled, certification that the product meets high standards for reduced environmental impact. 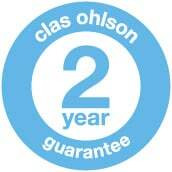 Clas Ohlson stearin wax candles are made of 100% pure stearin. Made in Delsbo, Sweden. Stearin is a 100% renewable resource, manufactured by combining various types of fat. Stearin does not drip, produce soot or melt in direct sunlight. These candles do not contribute to the greenhouse effect, unlike standard oil-based paraffin candles. Do not leave candles unattended when lit. A good practice is to make the person who lit the candles be responsible for putting them out. Never leave children or pets alone with candles that are lit. Place the candle on a level and fire-resistant surface, use metal or ceramic candlsticks. Never place the candle near flammable materials. Do not put the candles too close to each other – leave a gap of 7 cm between two lit candles. Never blow out candles, use a candle snuffer. Never move a candle that is lit. Would you like to add any related products to your purchase?